OpenGLSurface is a plug-in control for REALbasic. The plug-in provides an easy way to add OpenGL® 1.x functionality to your applications; it works with MacOS X (PPC, Intel & Universal builds) and Windows builds (XP and Vista). 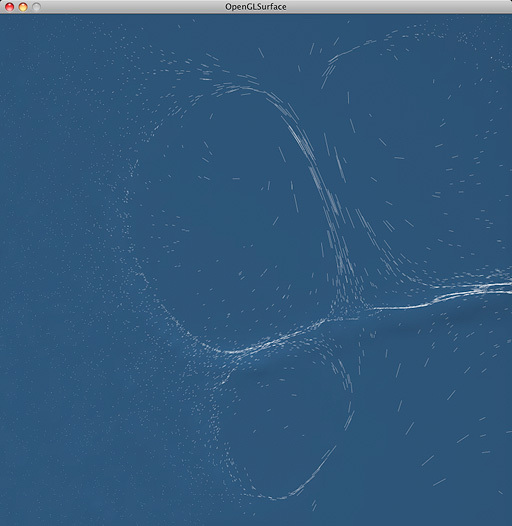 The OpenGLSurface is also the new OpenGL control behind our SuperSpriteSurface 2.0 framework. SuperSpriteSurface uses OpenGL functions to offload the graphics processing to your computer’s video card; it is available as a separate download here. OpenGLSurface is being provided free of charge to the REALbasic community. Copy the OpenGLSurface plugin to your REALbasic Plugins folder. OpenGLSurface does the basic set-up of OpenGL on each platform and provides a handful of functionality and to get you going — it’s still up to you to clear buffers, do all OpenGL drawing, etc, using the global OpenGL object which contains all the OpenGL calls and constants. The download archive contains documentation on OpenGLSurface. Below are some screenshots of the demo project that is included with the plug-in. 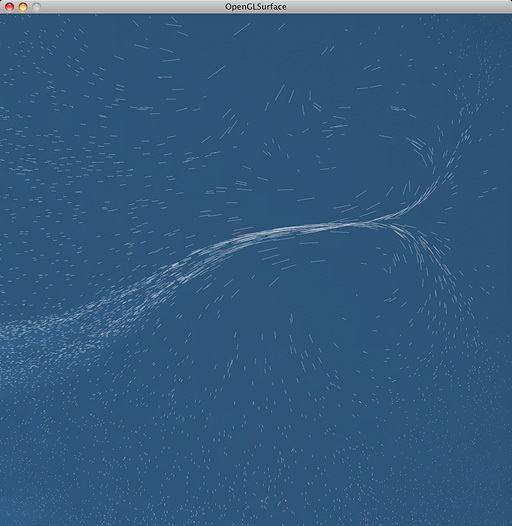 It is a simple fluid dynamics demo based on a sketch that ships with the Processing graphics environment. The REALbasic project makes (subtle) use of lighting and mesh rendering. It should be considered a very simple and non-optimized use of OpenGL.